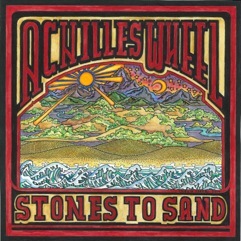 Achilles Wheel is a high energy Roots and World music/Rock and Roll band from Northern California, featuring award winning songwriting played on numerous stringed instruments and the rhythmic earthquake of two full drum sets. In the wake of their breakout performance at the 2012 Kate Wolf Music Festival, the band has been burning up stages all across California, including the Strawberry Music Festival, the legendary Sweetwater Music Hall and a repeat performance at the Kate Wolf Festival in 2013 that is still being talked about. Their new CD ‘Stones to Sand’ was released in June of this year and fully embodies the exciting musical growth Achilles Wheel is experiencing. Two sold out shows for the release party at the Crazy Horse Saloon in Nevada City on a balmy summer solstice weekend didn’t stop the large crowd of people who couldn’t get in from dancing in the street, since the doors and windows to the club were all open. This enthusiasm for Achilles Wheel ultimately earned them a spot at the 2014 California Worldfest through a ‘fan choice’ vote. And the Strawberry Music Festival also gave the band a call asking them to join the party this September when that festival will reemerge in it’s temporary new home at the Grass Valley Fairgrounds. The fiery epicenter of Achilles Wheel’s sound is Jonny Mojo on lead guitar and vocals, surrounded by Paul Kamm and Shelby Snow on rhythm, bass and vocals, and Gary Campus and Mark McCartney on drums and vocals. As original songs go, Achilles Wheel’s are some of the most accessible around and will stay with you long after the excitement of the show is over. These writers have been acknowledged by many of the biggest music festivals in the country including Kerrville, Telluride and Rocky Mtn. Folk. Two of their songs, ‘Got A Tattoo’ and ‘Let the Dream Begin’ have been recognized in the ‘Race to TRI’ song contest, which many on the West Coast will recognize as a premier audio/video production studio run by Bob Weir. Achilles Wheel has a great sound. These guys are local to me and I am so glad to see them getting the recognition they deserve. The strong song craft is evident and the level of musicianship is top notch. I couldn’t be happier to see them being embraced by audiences from the bay area to the mountains and out to the coastal communities too. Just great stuff, keep up the jams!